Nothing is as welcomed by a camper as a care package from home. At Camp El Tesoro (like many other camps) we do not allow food/snacks to be sent. Below are ideas and tips to pull together a dynamite, camp-approved care package! Artists package: Twistables, markers, coloring books, color pencils, origami books with paper, foam shapes/letters and cardboard. Ha-ha Hilarious package: Mad Libs, joke books and a kid-friendly "would you rather" book. You've Got a Friend In Me package: Embroidery thread in multiple colors (for friendship bracelets), Camp Bunk box of questions or a personality quiz book. The Gamer package: playing cards, UNO, plastic spoons, Me vs You challenge game and pencils. Flower Power package: Beads and fishing line for daisy chains, colored Zinka for face and arm art, crafting supplies. Night Vision package: Glow sticks, glow wands, flash light decals, anything that lights up and makes the dark a fun (but safe) place to play. Include instructions for these fun flashlight games too. Camp Birthday package: Funny birthday hat or shirt, party blowers, happy birthday banner, glow bracelets, colorful leis and a wrapped present. Old Fashioned Fun package: Frisbee, slinky, whoopee cushion, doodle face game, rubik's cube, mad libs and pick up sticks. Nature Lovers package: Native plant or animal guide, Night Sky guide book, star finder, sketch journal and pencils, insect observation kit, UNO Wilderness and kids binoculars. Sporty package: Volleyball or soccer ball with colored sharpie so that their cabinmates can sign it, beach ball, small foam footballs, disc golf disc, pool frisbee, headband and juggling balls. Camp is a time for building bonds, so consider care packages that will not only remind your child you are thinking of them but allows them to build bonds and play with their cabin mates. Don't feel like you have to break the bank. Hit the $1 Spot at Target for some summer inspiration. Plus! 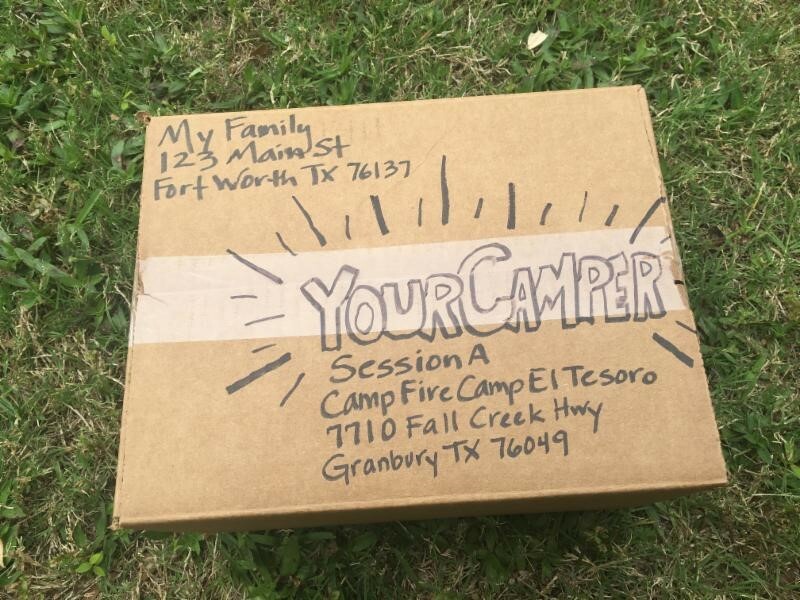 At El Tesoro, you can hand off your child's care package to the staff during drop off on Sunday and they'll deliver it to your camper on the day you choose. Bottomline, have fun with any package or letter you send your camper and it will be the perfect amount of home away from home. Shopping at Amazon for your care package items? When you shop at AmazonSmile, Amazon donates 0.5% of the purchase price to Camp Fire First Texas. Bookmark Smile.Amazon.com and select Camp Fire First Texas to support us every time you shop.